You Get What You Pay For…Sometimes. [I]mproving teachers’ pay improves their standing in a country’s income distribution and hence the national status of teaching as a profession. As a result of this higher status, more young people will want to become teachers. This in turn makes teaching a more selective profession and hence facilitates the recruitment of more able individuals. Higher status and higher pay are invariably linked but the two can provide separate driving forces to engineer better recruits to the profession. The key hypothesis is that better pay for teachers will attract higher quality graduates into the profession and that this will improve pupil performance. Removing all the other countries shows the stark disparity between Finland and the US. The Finns only pay their teachers marginally better than we do, yet student achievement in Finland is significantly greater. Why? Here’s a hint: It’s got nothing to do with money. 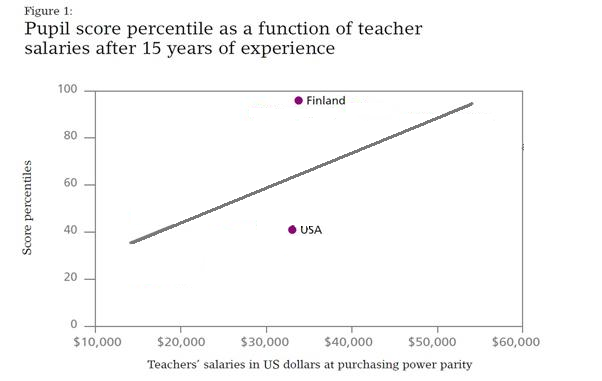 I make no claim to be an expert on the Finnish education system, and I’ll admit that most of my knowledge comes from Wikipedia (don’t criticize – it links to legitimate references) and several other online sources, but the conclusion seems clear to me: student performance is tied more to social and governmental perceptions of education than to teacher salaries. Here is a really interesting interview with Dr. Pasi Sahlberg, Director General of the Centre for International Mobility and Cooperation in Finland’s Ministry of Education and Culture. Most educational ideas that we are employing are initially from the U.S. They’re American innovations done in a Finnish way. You know, in the United States, there are more than enough ideas, there’s superior knowledge about educational change and you speak a language that has global reach. If you want to learn something from Finland, it’s the implementation of ideas. It’s looking at education as nation-building. We have very carefully kept the business of education in the hands of educators. It’s practically impossible to become a superintendent without also being a former teacher. … If you have people [in leadership positions] with no background in teaching, they’ll never have the type of communication they need. Letting teachers control education contributes to higher student achievement?! Who knew?! And what a novel idea it is to want those in leadership positions to have backgrounds in education. By comparison, educational leaders in the US have backgrounds as master hairstylists. 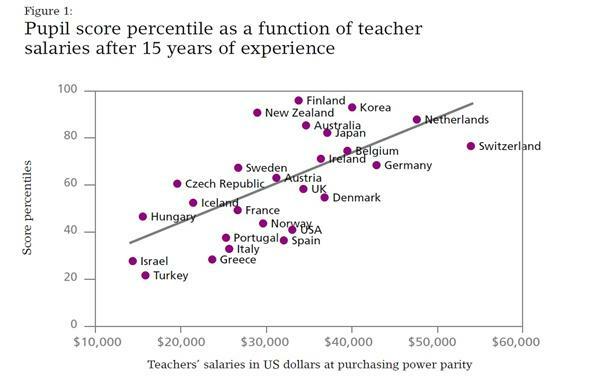 It’s very difficult to use this data to say anything about the effectiveness of teachers. If you tried to do this in my country, Finnish teachers would probably go on strike and wouldn’t return until this crazy idea went away. Finns don’t believe you can reliably measure the essence of learning. You know, one big difference in thinking about education and the whole discourse is that in the U.S. it’s based on a belief in competition. In my country, we are in education because we believe in cooperation and sharing. Cooperation is a core starting point for growth. This is in addition to the fact that Finland has no high stakes testing. <-take your pick of the links there for a source. In Finland, unions aren’t an obstacle. Ninety-eight percent of teachers are unionized. And this is very important to the success of our system. I wouldn’t buy the argument that unions are a problem. So throwing money into teacher salaries isn’t going to improve student achievement on its own, but it can contribute over time. What about the money then? I’m not saying that money has no influence in education. I’ll argue anyone who claims teachers are overpaid, but the fact of the matter is that paying teachers more now won’t make them work harder, and it won’t have any noticeable effect on student achievement any time soon; however, it will – over an extended period of time – raise the social perception of teachers, create more competition, attract better candidates, and eventually improve student achievement. It won’t happen overnight, though. And it won’t happen without eliminating the social, political, and economic barriers holding US teachers and students back – factors that are far more important to student achievement than my paycheck is. Saying that higher teacher salaries will contribute to improved student achievement is tantamount to saying that nails and wood will contribute to building a house – you’re going to need a lot more than that. But hey, I’m not going to turn down some extra scratch if the government decides to give it to me. This entry was posted in Education Reform, Rants and tagged education, education reform, Finland education, teacher salaries, teaching. Bookmark the permalink.